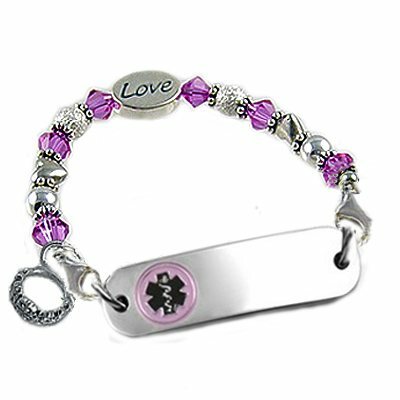 This very "PETITE" and feminine style with lots of tiny sterling hearts, sterling silver rings attached to our "petite" stainless medical id tag. 5mm sterling silver stardust rounds, 5mm sterling rounds, dotted spacers, a 12mm sterling silver "LOVE" bead, and 5mm Swarovski crystals in the color of your choice. No further discounts on this laser engraved product.